When we first bought our Pacific Coachworks Tango travel trailer last year, one of the first accessories that I bought were Lynx Levelers. I didn't want to bother with heavy scrap pieces of wood to level the RV and I really liked the bright orange colour of the Lynx. They are very easy to use especially since the Hoppy bubble levels that I mounted tell us how many inches to raise the trailer, and each of the Lynx Levelers are about 1" tall. There was never any guessing to how high to build the stacks. ...Even though it was just cosmetic and they worked just as well under the stabilizer jacks, I still thought about buying a new set. I was pleasantly surprised when at the end of the weekend, the bent levelers had all come out straight again--just like new. Impressive! Another thing I was happy about was the performance of the Lynx Stop 'N Chocks. I had sold my BAL Deluxe Wheel Chocks because the Keystone Premier has extra wide axles so they would not work any more. I bought the Lynx chocks because they connect with the levelers and provide safety even when the tires are raised. I discovered that even without the BAL chocks the trailer was very stable and had very little movement. 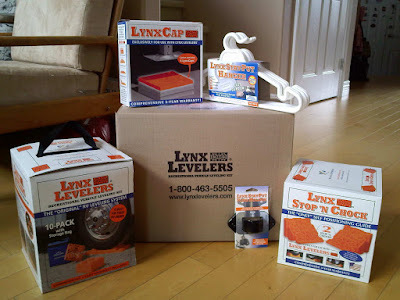 One last thing about Christmas in May: This week Tri-Lynx sent me a box of additional levelers and chocks as well as a few other products shown above and wrote a very nice letter in appreciation of my business. Now that's really impressive!